Google+ Reading Teen: GIVEAWAY: How To Train Your Dragon by Cressida Cowell Books 1-8 on Audio, Read by David Tennant!!! GIVEAWAY: How To Train Your Dragon by Cressida Cowell Books 1-8 on Audio, Read by David Tennant!!! Listen to the original bestselling series that inspired the hit movie sensation! How to Train Your Dragon chronicles the adventures and misadventures of reluctant Viking hero Hiccup and his dragon, Toothless. Join them on their first nine adventures in How to Train Your Dragon: Hardcover Gift Set. 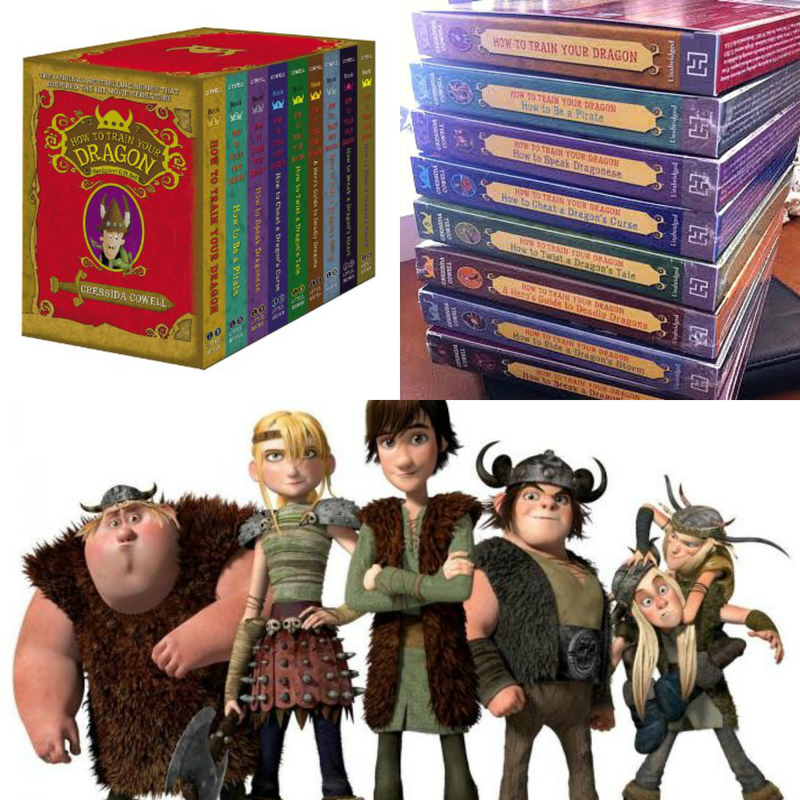 This hardcover boxed set includes: How to Train Your Dragon; How to Be a Pirate;How to Speak Dragonese; How to Cheat a Dragon's Curse; How to Twist a Dragon's Tale; A Hero's Guide to Deadly Dragons; How to Ride a Dragon's Storm; How to Break a Dragon's Heart; and How to Steal a Dragon's Sword. Ohh my niece would LOVE these! It would definitely be for me and my boyfriend. We loved the movie and the tv show and I've been wanting to read the series. I am elementary school librarian. I would give it to one of my students or maybe put it in the collection. This would be so awesome to read and listen to! I have been wanting to read this SO much and audio books are my favorite thing. PLUS David Tennant? I would absolutely adore owning these! I work in child care and would add this to our library there. I LOVE the movie. In fact, it was on tv last night and I watched it. I would listen to this first and then would probably send it on to my nieces and nephews. I think I'd listen to it first but it would probably go to the library eventually. Thanks. Both! I love these books and I want to one day share with my kids! It would be for my 8 year old son but I will probably listen to it also. My son would love the audio books. Thanks for the giveaway. It would be for my 8 year old son, but I love David Tennant, so I'll enjoy listening, too. My students would love this!!!!! It would probably be for my niece, but I may give them a listen too! :) Thanks! I would love this! How To Train Your Dragon was a great movie, and I'm excited for the sequel! Plus, DAVID TENNANT! My girls and I would love listening to these. And since the hubby is a huge Dr. Who fan I might be able to get him to join in. I'd read one for sure, but they'd be for the students I teach! My nephew would love these! This series would be for me and my nephews when they visit me. I would be able to entertain them while I'm babysitting them for my sister. This would be for me. I love these audios! What a fantastic contest! My whole family would so enjoy listening to David Tennant read anything ;) but we really enjoyed the movie, so it's a win-win! For my husband and I. We're kid enough. Both! I believe in sharing. For my whole family to enjoy! We love HTTYD! My kids and my sisters kids will LOVE it!! Sharing is more fun! My children would enjoy this, but my wife is also a huge fan of David Tennant and she might just confiscate them first! This would be both for me and my 11yo. We're huge HTTYD fans AND huge David Tennant fans. I so want this! For me! I love this series. And love audiobooks. These audiobooks would be for the kidlets in my life (though I wouldn't mind giving them a listen myself).